"Watson operates from a far slimmer playbook than Andrew Luck, with some rather basic channels and formations that are easier to decode"
After a few deeply disappointing Monday Night match-ups, it appears the primetime schedulers have finally donned their thinking caps. Of course, nothing will come close to last week's LA Rams versus Kansas City Chiefs shootout which was of Big 12-busting proportions. 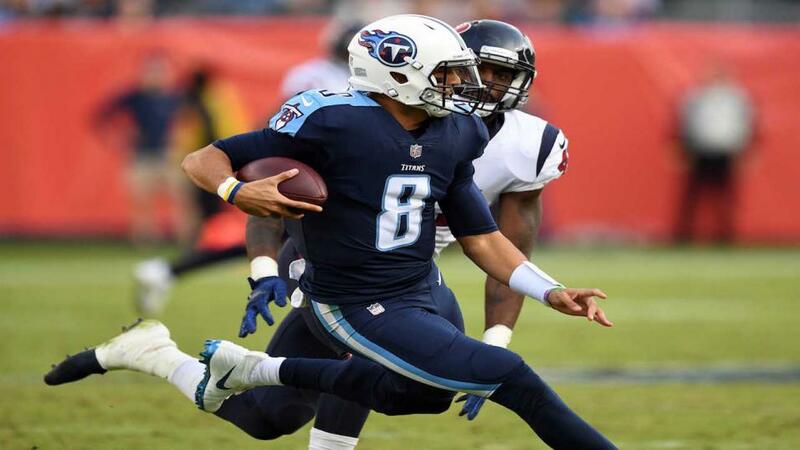 However, tonight's MNF provides another pivotal divisional dogfight between the Tennessee Titans (5-5) and the Houston Texans (7-3) in a duel for the for AFC South supremacy. In this aggressively average division, divisional head-to-heads should count for a lot, especially if the Titans prevail this evening. A Tennessee win would also return fluctuating fortune into the hands of the stampeding Indianapolis Colts (who have won five on the bounce under a resurgent Andrew Luck) who would then control their own destiny in this division: win out, and they suddenly become post-season pretenders in perhaps the most inconclusive Super Bowl book in recent memory. That said, for now, it seems that the Texans have their fate in their own gloves, particularly those of dominant defensive end JJ Watt, having got out of jail against the Washington Redskins, cruelly ending Alex Smith's promising campaign in the process with a broken leg. Watt delivered that telling blow, but there was naturally no malice behind it. Watt is one of the good guys, who works hard and plays harder. After all, you don't become a three-time defensive player of the year without the requisite work ethic. Watt's heartfelt reaction to smashing up Smith was understandable. "I felt sick to the pit of my stomach, just terrible," he said. "It's happened to me before, so I know a little about what he's feeling." Now I'm no psychotherapist - and despite his gentle giants status off the field, Watt isn't the go-easy type on it - but I wouldn't be surprised if there was some let-up in the four-time All-Pro's performance tonight. Watt wouldn't be human if the column inches surrounding Smith's long road to rehab didn't slow him a stride. All of which is good news for Tennessee quarterback Marcus Mariota. Not that Mariota has ever been Watt's whipping boy. In fact, Watt's defensive records for sacks come against the other two QBs in this division, Andrew Luck and Blake Bortles. This fact alone demonstrates that Mariota's dual-threat versatility will always offer him some escape exits from the oncoming onslaught of Watt and, to a lesser extent, Jadeveon Clowney. By his own tall standards, Mariota has had an underwhelming year after struggling to recover from his own injury concerns. Indeed, for much of the year, he hasn't even threatened the 200-yards-per-game mark. But his arm-speed and pocket-poise are returning, and even an away game against a defensive powerhouse which is not what it was gives him the chance to reassert his elite credentials. Particularly given Tennessee's very balanced running and receiving crews, who can keep the chains moving in a number of ways. Such flexibility will give the maverick Mariota an edge tonight. Of more concern to the Titans must be the re-emergence of Deshaun Watson under center for the Texans. Watson instantaneously made the Tom Savage era feel like an unpleasant, distant memory with a breakout rookie campaign. And his own twin skills, as a playmaker from the pocket with a big arm, are now returning to their initial promise. Watson's imposing athleticism and physicality routinely make him a weapon outside the pocket. However, inside the pocket he's showing some progressive discipline too, so the Titans will have to be on their mettle here, lest Watson cuts loose with some big gains. That applies double for their susceptible cornerback Adoree Jackson, who was ruthlessly targeted and exposed by Luck and TY Hilton last week. Watson, though, operates from a far slimmer playbook than Luck, with some rather basic channels and formations that are easier to decode. Expect their doughty D to get up in Watson's grill and make him miss his receivers. If Mariota can minimise his early-season mistakes, he can do the rest and snap Houston's seven-game winning streak in the process. Which will blow this division wide open. As I said, watch out for those ripsnorter Colts.